If you were a coach, would you voluntarily give up a down at some point in the game, just to be sporting? Ehh, let's just make it 3rd and 5 instead of 2nd and 5. Of course not. For a random play in the 2nd quarter, that would cost you about 0.02 WP (2% chance of winning) for no reason. So why do NFL coaches voluntarily leave WP out on the field? Take yesterday's DEN-SEA game as an example. SEA was ahead 17-12 in the 4th quarter, and had the ball deep in their own territory with about 9 minutes to play. With the game clock running, they snapped the ball with: 8, 5, 5, 8, and 10 seconds left on the play clock. That's a total of 36 seconds. Plus, there was a play in which the receiver could have just as easily remained in bounds. Because there was more than 5 minutes left in the game and the clock restarts after the ball is set, that may have only cost 10-15 seconds of play clock rather than up to 40 seconds. To be fair let's say there was a total of 46 seconds SEA could have burned off the clock during their second to last drive with almost no effort or risk. Except for particular situations, it's always better to have less time on the clock when you have the lead. The exceptions are when the game is within one score and the opponent has the ball within reasonable scoring distance--near FG range when within 3, around the red zone when within a TD. Otherwise, it's pretty simple. When you have a lead, the less time on the clock the better. In this case the difference between giving DEN the ball with 5:21 left and 6:07 left is small in terms of WP--about 1%. But why give away all that free time and WP? As I wrote last week, coaches stay up all night long looking for that last 1% edge. Don't squander it. Certainly an offense can't squeeze every last second off the clock, but it's reasonable to let the play clock wind down to a couple seconds before snapping. Every second helps, even if just a tiny amount. As the game turned out, after a SEA field goal, DEN managed to tie the game with a TD and two-point conversion on a drive that started with only 59 seconds to play. 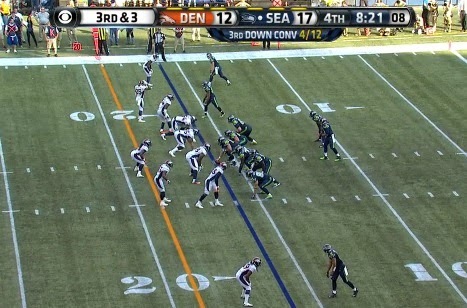 I'm sure SEA would have preferred that DEN only had 15 seconds left to try to tie on that drive. Although that's an unfair way to think of it because we don't know how the game would have unfolded had there been less time on the clock, it illustrates how tiny differences can sometimes add up to make a decisive difference. Forgot to mention...Cal might want to take this advice too. A post on giving up WP, and not a questioned 4th down decision in sight. The funny thing is clock management is something every Madden player knows intuitively. Stopping running on the 1 if you're down by less than a FG late on, using timeouts at the right time, burning the clock if you're ahead. All of this stuff is thought of as crazy or inventive in the NFL when it should be basic tactics 101. There should be a bunch of Madden 101 questions on the wonderlic. When I saw the title and the still from DEN-SEA, I assumed this article would be about Denver running draw plays on 3rd and long. Maybe other factors outweigh milking the clock another 2 seconds. Perhaps you want your QB to go when he's ready, or when he sees the defense leaning, or off balance, or when he feels the offensive players are working together well because a certain tempo has been established. Is it possible they get more than a 1% advantage from other factors that compete with the goal of milking the most time they can off the clock? Anon2 - well, taking time off the clock is measurable and demonstrably effective. Those other things seem like they are much harder to document and measure in any reliable way. I think that is the whole point of analytics over 'other factors/gut feeling' stuff. We all get it that those intangible factors might be a factor, but you have to show why or how. Especially when non-intangible factors demonstrably make up the majority of what is going on in a football game. Running the clock down to zero is not really an option, especially as a solid rule. First, chances of a delay of game will be increased. Second, the defense can see the clock too, if they know when the snap will be they have a great advantage (over not knowing). It is far more important to execute your play well, than to nickel and dime the clock. Similarly with going out of bounds. It may have earned an extra yard, rather than moving towards the defender. That is ignored. It also guarantees no fumble, as opposed to a non-zero fumble risk moving into the defender. It also greatly reduces injury, if your star receiver is blows out a knee gaining 10 seconds, it was not worth it. Many details are ignored in this article, and since the final answer is only 1%, then all these details are probably important. Also, wouldn't the broncos time management make a much bigger impact on the game? They could have hustled out of the huddle 3 seconds faster on all their snaps, and saved themselves much more time. They were losing the whole 2nd half, that's a lot of plays. I think just about every other play that occurred over that time range had a bigger effect on the outcome, than this. Even if we could isolate the time difference from the rest of the game, and assume no difference in the offense outcomes or the defense outcomes, the 1 in 100 effect isn't a compelling reason. How about keep playing aggressively? While I know people hate when teams run up the score but its better than losing a game you had in hand. Isn't there some game theory involved here? If you snap the ball at the clock every time, the defense will know exactly when to come across the line or show a blitz. If you snap the ball with 7 seconds left the defense maybe hesitates for a fraction of a second, because they don't want to draw an offsides. I believe the best option in such circumstances is to look to snap the ball non-predicatively within a few seconds without risking the DoG that might have a bigger impact. Allowing for the snap count say roughly 3sec plus or minus on a fixed time, which by definition would be close to 5sec on the GC. So maybe the Seahawks were a little on the generous side. Matt Ryan did the same thing to Seattle with about 30 seconds left in the playoffs two years ago. Nearly everybody has forgotten that while Denver had no timeouts, they got a free one when Chancellor nearly killed Buerle. Otherwise, we are probably not having this conversation. Everything went right for Denver. There was a missed field goal. There was an interception on a tipped ball. There was a safety.